Mezes Greek Grill is proud to announce it recently relaunched its website, which now includes blogs, featuring information about Greek culture, family, food and recipes, as well as providing images of its authentic Greek dishes. In fact, for over half a century the Roumanis family has been satisfying the palates of University of Michigan students, professors and parents alike, as well as local residents and professionals. Mezes uses whole lamb and beef supplied by a local butcher, seasoned with the Roumanis family recipe and then hand-stacked on the spit for its revered gyros. Mezes also offers spanakopita (spinach pie), souvlaki (meat on a skewer), signature salads and baklava. 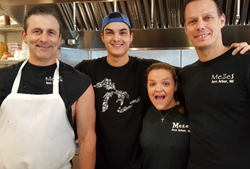 Dimitri Roumanis, Stavros Sianos and Stathis Govathsos established Mezes Greek Grill after they noticed a lack of quality Greek cuisine in Ann Arbor. Many of the restaurant’s recipes are those that the gentlemen grew up eating both here in the states and in their familial villages in the historic region of Lakonia, Greece. For more information, please call (734) 369-2204, or visit their Facebook page. Mezes Greek Grill is located at 715 N. University, Ann Arbor, MI 48104.